I broke out the glass in our utility room door. We were dreading having to replace it, as we have never had to before. My husband got measurements and I went off to Google for local businesses that sold the glass pane replacements. I have to say your company is smart, your business link came up in the top search. Accessing your website and your product description was easy and detailed. The Universal Lite Glass & White Frame was the exact size we needed. I ordered it and it was delivered 2 days later. Wow! Was I impressed. We just popped out the old frame and popped in the new one with the glass pane in it and that was all we had to do. My husband and I were very impressed. 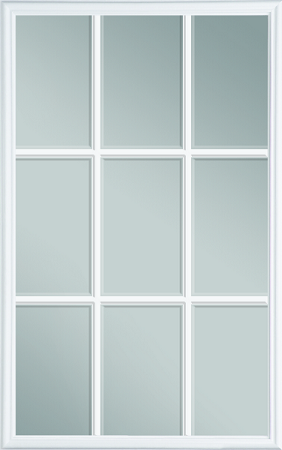 A nice solid window. Great service excellence. Quick delivery, perfect fit, easy installation. Looks great and easy job to complete. Can't believe the previous owners of my house left the old POS half broken window in that door. They were lazy and cheap. This product was excellent! Shipping was also excellent as I was very suprised that during the Christmas season I received this in a matter of days. Thanks so much! Great job! Order came very quickly, packaged very well (no damage), and went up easily, than getting old painted and broken on out.